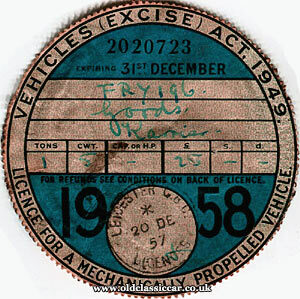 Car tax discs of the 1950s - a study in Velology. Homepage. 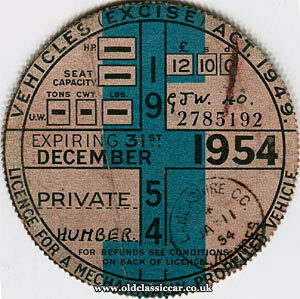 This page: Selection of original tax discs, as fitted to UK-registered cars in the 1950s. 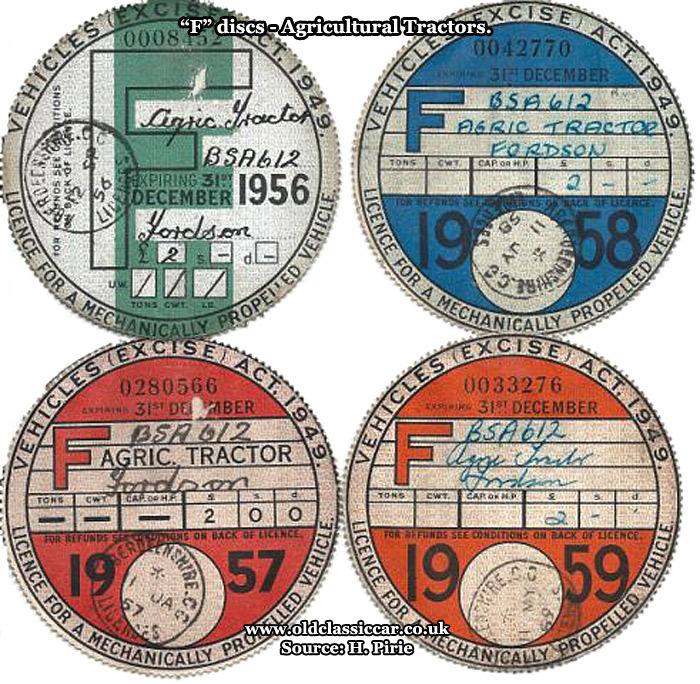 Tax discs of the 1950s. "Road Fund Licence", and "Vehicle Excise Duty", are both terms that have referred to the levy of taxation on motorists in the UK. The original VED was dreamt up in 1888, and was replaced by the Road Fund Licence in 1920, funds raised by it being targeted to increased road building and maintenance. From 1937 these same funds were re-directed into the general taxation pot, something that has continued to this day. January 1st 1921 witnessed the introduction of the now-familiar circular paper disc, the display of which was compulsory from its introduction in 1921 right through until 1st October 2014, when the issuing of tax discs, as they're near-universally known, ceased. No more tax discs will be produced by DVLA, some motorists will miss them, while others won't bat an eyelid over their demise. Students of velology - the collecting of expired tax discs - now have a set timeframe from which to collect examples. As with collecting stamps, there are rare discs and not-so-rare discs, with those from the 1920s - especially if they are still mounted in the "selvedge", or border, from which they are usually removed prior to display on a motor vehicle - being especially sought-after. In later years, the discs had perforations around their edges, making it simple to neatly remove them from the selvedge. However in the olden days no perforations were used, requiring the motorist to cut out the discs - often with varying degrees of accuracy and neatness, as surviving discs amply demonstrate. The vast majority of tax discs were simply thrown away once they had expired. In 1923 it became compulsory in fact to destroy them, further depleting stocks for collectors who hunt down the earliest examples today. I've a small collection of discs myself, the majority of which I found beneath a seat in an old car I own, tucked away in a leather wallet. I can only think that a former owner of the car was a garage-owner or motor dealer. All manner of vehicles feature across the discs I found, although curiously not one relates to the car in which they were discovered. This page features examples of discs issued in the 1950s, discs from other eras will be added later. 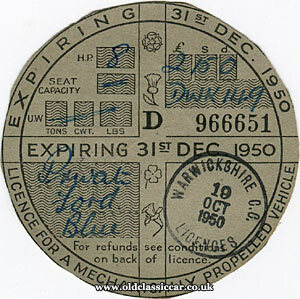 DWK 149 was an 8hp Ford finished in blue, and of the nine discs featured on this page, four of them apply to this "upright" Ford. DWK was a Coventry number. This disc, from 1950, was issued by Warwickshire County Council on 19th October 1950. Needless to say, this was long before the introduction of DVLC (later DVLA) in Swansea, at a time when local councils handled local vehicle registration and taxation themselves. Discs were available on a quarterly or annual basis, this being an example of the former, set to expire on 31st December 1950. The date stamp is nice and clear, and contained well within the border of the disc. Note how this disc has been cut out, rather than relying on perforations. Still with DWK 149, this quarterly '51 disc was issued in Warwickshire. The datestamp is for 19th April 1951, and was valid until the end of June. This disc has the year "1951" printed down the centre of it, while that from 1950 instead has a variety of flora to represent the UK - ie the Shamrock, Thistle, Rose, and Daffodil. 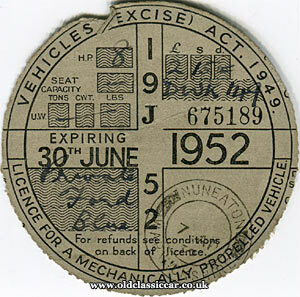 The '51 disc also makes reference to the Vehicles (Excise) Act of 1949. This disc follows on from that shown above, the colour changing from red text on a yellowy background, to red text on blue. Only one disc for the Ford in 1952 here. The issuing authority's stamp has now altered to "Nuneaton, Warwickshire". Expiry date is 30th June 1952. A different vehicle now, a Humber, and a journey northwards from Nuneaton to the wilds of Lancashire. What model Humber it was affixed to isn't recorded, and the sections where it would normally be handwritten in are pre-blanked off, and no longer required. The cost of the disc, here a 12-month type, is also pre-printed. Only the vehicle make and the registration - GJW 40 - are in ink. The GJW series was introduced in Wolverhampton, in October 1948, confirming that this disc applied to a post-war Humber. Four years have passed and it's now 1958, the first of two such discs I have here. Here, as with the earlier discs, the vehicle details are handwritten in ink, and the disc's design has changed noticeably. 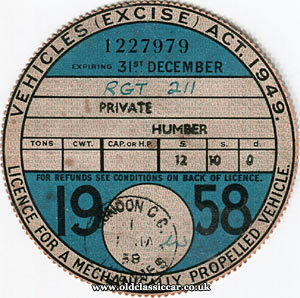 This 12-month disc was purchased on 20th December 1957, and applies not to a private car, but a Karrier 1 ton 5cwt Goods vehicle registration FRY 196, a Leicester-registered lorry being taxed in the same area. Another annual disc running from December 1957 to December 1958. This though is a London issue, for a privately owned Humber registration RGT 211. Although the scanner hasn't picked up the colours 100% accurately, the shade of blue on this disc is lighter than that for the previous Karrier, probably as a result of differing storage over the intervening years. Back to the Midlands now, Coventry to be precise, and AOR 279, a Standard. As with an earlier disc, the specific HP details of the car are no longer recorded, being a Private vehicle. 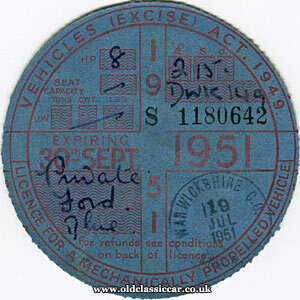 This disc was issued on the 18th June, and ran only until 30th June of the same year. Curiously the date stamp has an "8" written over the "9" of the 1959 year. The AOR series was first used in May 1935, confirming that the Standard was of pre-war origin, and getting on in years at the time. 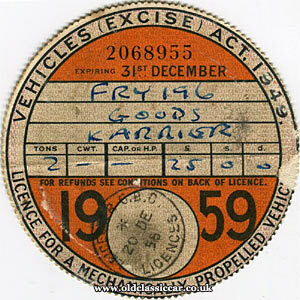 The final tax disc in this set, and FRY 196, the Karrier Goods vehicle, makes a re-appearance. It's now classed as a 2-tonner, but remains in Leicester. Coincidentally, the car I found all these discs in also came from Leicestershire. What makes some discs more sought after than others? Condition is, understandably, critical as discs exposed to the elements in open-top cars, and on motorcycles, may well have suffered more than those tucked away in the cosy confines of a saloon. Those raised for agricultural vehicles (see further down this page for examples), and those used in public service such as buses, coaches and taxis, are typically rarer than those for privately-owned cars. Some pre-war discs (1925-onwards) also feature advertising on their reverse, while those with the aforementioned selvedge still in place, will also be looked on with approval by die-hard velologists. Discs issued in Northern Ireland and Wales are also less commonly found, so are worth keeping an eye out for. Sequences of discs that all relate to one particular vehicle will, I think, have more interest (and maybe financial) value to a collector, than the same number and age of discs, relating to different vehicles. While a very small number of tax discs could be worth into the hundreds of pounds, the majority though will be worth considerably less. As a result, collecting these now-redundant relics of a byegone motoring age, makes for an interesting pastime, especially if time is spent researching the vehicles they once belonged to. Replica tax discs will, I'm sure, become an increasingly popular addition to the hordes of preserved motor vehicles out there. Of course, to complete the "look", suitable tax disc holders will also be required, this page features a number of once-popular styles. Henry's been in touch. He's interested in older tractors, amongst other things, and owns a fine Fordson. When he bought it, over thirty years ago, it came with a selection of original "F" (for Agricultural Tractors) discs from the 1950s. They date to 1956, 1957, 1958, and 1959. He was kind enough to scan them in and send them over for inclusion here. "F" is also the modern-day licence classification for being permitted to drive a tractor on the public road. The disc for 1956 features a large letter "F" upon it, reducing in size for subsequent years. Thanks for sending it over. Return to the Motoring Collectables section, to read about other items similar to this. 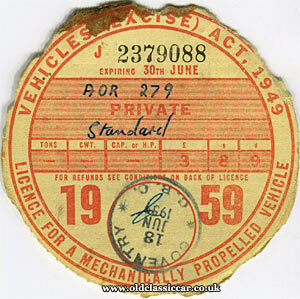 Also see: Tax discs (road fund licences) of the 1930s.